Please provide as much information as you can about the item you are needing help with. Provide photos of the object you are asking about. Include a description of the item you are asking about (size, color, markings, condition, date). The more information you can provide, the more information, we can provide you! My ideas: I can't tell if it's wood, metal, ceramic or plastic. I can't tell how tall it is; it could be a thimble for a finger, or a finial off a lamp, or a bell, or a double boiler pot, or off a rotary lawn mower, or off a steam engine. Size matters. You need to provide more information; we are not mind readers. Had you read the instructions you would know that Molly's reply is what the instructions tell you. I guess you're probably new here...Welcome to IAO! 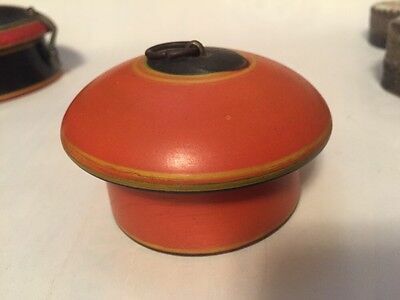 It looks like a Chinese or Japanese tea caddy to me. Though there are a wide variety of those, the shape to me screams Asian influence. The photo you showed of its inside appears quite stained, though not sure if that is simply part of the finish as similar marks appears on the underside. I agree with the others also, in that we need additional information, dimensions, other photos of it open from a little further back so we can see it as a whole. Closeup photos are great and we should always have them, but seeing how it opens and from different angles helps us understand how it would look if in front of us, not just the 2D aspect of photographs. hi, thanks for all the help I believe this is made of wood. I will be more detailed in the future. William you took away one of the photos showing the underside of the container... you'd be better off adding more images. Also, is there any writing visible on the item, either inside or outside? There does seem to be something written on the inside. Now that I can see what size it is, I am thinking antique wooden snuff (opium, trinket) box.